Property Size 1,760 sq. ft. This beautiful 3 Bedroom/2 Bath home is located in the neighborhood of Caribe with a gated entrance, plush landscaping, two swimming pools, tennis court and two private dune walkovers leading to the beautiful white sandy beach. 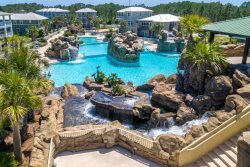 Caribe is located very close to the Silver Sands Outlet Mall, Sandestin Resort, as well as several great restaurants. This home features a gated community on the beach with no roads to cross! Enter the home to soaring cathedral ceilings, spacious outdoor porches, and beautiful courtyard entry with ample parking. The master suite is located on the first floor and has adjoining master bathroom with dual vanity, walk-in shower and granite tile surround. There are also two additional bedrooms, one downstairs and one upstairs. The gated neighborhood offers, 2 community pools Tennis court, 2 Deeded beach accesses, security patrol and just steps to the beach or pools. Centrally located near boutique shopping, restaurants and entertainment. Maximum occupancy is 6 guests. (this includes children) per the neighborhood association. The neighborhood security strictly enforces this rule and will force the property manager to move any extra guests. Thank you in advance for compliance. Add $140 for housekeeping and 11% for tax. $69 Damage Protection Fee, $30 Booking Fee, 2.5% processing fee on credit card payments. We require a 25% deposit upon booking.